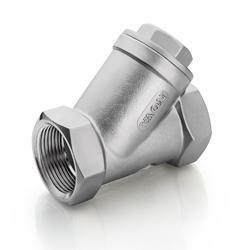 Our product range includes a wide range of y type strainer. Large screening area makes the strainer extremely efficient in performance. Fine finish and smooth contours to minimize pressure drop inside the strainer. Body Test Pressure: 300 PSIG (21 bar) Hyd. Seat Test Pressure: 220 PSIG (15.4 bar) Hyd. & 100 PSIG (7 bar) AIR.